By promoting "the integration of telecommunications and life design," and by providing new experience value as "the company that customers can feel closest to," "the company that continues to produce excitement,"
KDDI aims to balance both continuous profit growth and the enhancement of shareholder returns. I would like to express our gratitude to our shareholders and investors for their constant support and understanding. I assumed the position of president on April 1, 2018. As KDDI's new president, allow me to first explain our vision for what we wish the Company to become. About 20 years have passed since the birth of the mobile Internet, and in that time a wide variety of innovations have occurred. Telecommunications and the Internet have connected people with other people around the world, have linked people with things, and things with other things. At the same time, new technologies have rapidly evolved to add value to those connections, including big data, artificial intelligence (AI) and Fintech, all of which herald significant changes for people's lives and across all industries. In this age of major change, the key phrase to achieving my vision of what KDDI should become is the integration of telecommunications and life design. With telecommunications―the foundation of our business―at the core, we will build a layer of life design services essential to our customers' lives, including in commerce, finance, energy, entertainment and education. Further, we will accelerate efforts to provide new experience value utilizing a variety of technologies, including IoT, for which momentum is gathering, as well as next-generation mobile telecommunications systems (5G). To achieve this, I would like to pursue two visions of what KDDI will become going forward. The first vision is to be a company that customers can feel closest to. I would like KDDI to be a company whose offerings customers feel always come from their perspective and take their convenience into consideration. 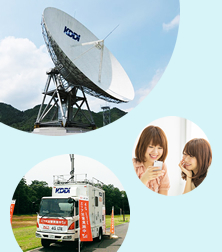 With the telecommunications business as its base, for many years KDDI has done business as a communications company, connecting people with people and companies with companies. In that process, our hearts have always been with the customers, and that is something that will never change going forward. 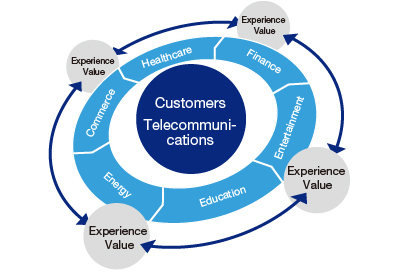 Because of the nature of the business, telecommunications companies tend to fall into a "product-out "mindset, but I believe what is important is a perspective that asks how the products and services we provide are useful to customers. Through our touch points via our au shops, customer support centers and a variety of apps, we work toward the goal of becoming a company that customers can feel closest to with a deeper understanding of the customers, and enhance their experience value. The second is for KDDI to be a company that continues to produce excitement. It is only natural that, as a company fighting in a competitive environment, we are expected to deliver results in the form of revenue, profits and subscriber numbers. Strict pursuit of such numbers, however, doesn't mean conflict with a positive approach to our work or finding joy in benefiting the customer. Our goal is to build a reliable telecommunications network centered around the customer, become a presence that customers can feel close to, and gradually make customers' lives more enjoyable through a variety of touchpoints. An approach by which a company introduces products and services that are developed less in line with market needs than with an emphasis on the company's own inclinations and technologies. 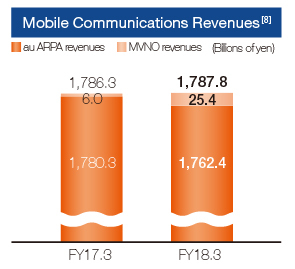 Looking back at the past two years covered by KDDI's current medium-term management targets, the products and services provided by three MNOs  have become increasingly homogeneous, while low-priced SIM services through MVNOs  have grown in popularity. In addition, regulations and their enforcement have been strengthened, like "the guidelines for adjusting handset subsidies" from the Ministry of Internal Affairs and Communications. These and other significant changes in the environment surrounding the domestic telecommunications market have prompted the three MNOs to expand into other fields of business to generate earnings. Meanwhile, companies from a wide variety of industries are entering the mobile market as MVNOs, and the telecom market is heading into an age of competition beyond industries. Other new changes in this environment include the expected entry in 2019 of a fourth mobile operator in the domestic telecommunications market, the first since EMOBILE appeared on the scene about 10 years ago, and the entry in 2018 of a fourth operator in the mobile telecommunications market in Myanmar, a market we entered in 2014. KDDI expects that the competitive environment surrounding the business will continue to change significantly not only in Japan, but outside Japan as well. 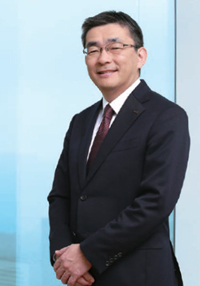 In the midst of these changes, KDDI's first goal is to achieve the targets of its current medium-term management plan, and then steadily implement efforts toward achieving continuous growth as part of its next medium-term targets. Mobile Network Operator. An operator that installs and manages its own network of telecommunication lines to be used by mobile phones and other mobile communication devices, and that provides its own telecommunication services. 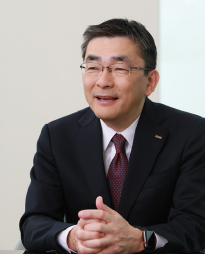 KDDI set medium-term management targets for the three-year period ending March 31, 2019 for transforming into a "Life Design Company" that provides customer experience value. 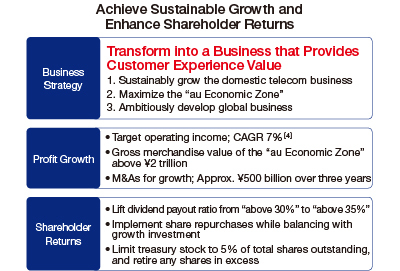 Based on the three business strategies of "sustainably grow in the domestic telecommunications business," "maximize the 'au Economic Zone,'" and "ambitiously develop global business," KDDI aims to both achieve sustainable growth and enhance shareholder returns. More than a few regard this transformation into a "Life Design Company" as a shift of KDDI from being a telecommunications operator to a life design company, but this is not the case. KDDI's business will continue centering on telecommunications, and it has changed how this is expressed by referring to the integration of telecommunications and life design, in an effort to make it easier to understand the strategy of building a concentric ring of life design services around the core of telecommunications. The fiscal year ended March 31, 2018, the second year of the medium-term targets, resulted in a number of new initiatives. New price plans were introduced in our domestic mobile business, the "au Pitatto Plan" and the "au Flat Plan," and in the life design area, KDDI entered the education business with its acquisition of AEON Holdings. 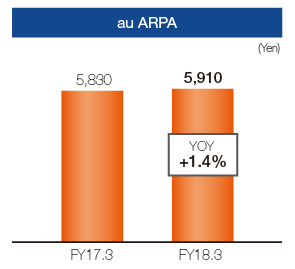 In terms of performance, while strategic costs were spent targeting retention and strengthened e-commerce, mobile communications and value-added ARPA revenues both increased, and with the contribution of increased profits in the Business and Global Services segment, consolidated operating income rose 5.5% year on year to ¥962.8 billion, representing steady progress toward our medium-term target of a CAGR of 7% for consolidated operating income. 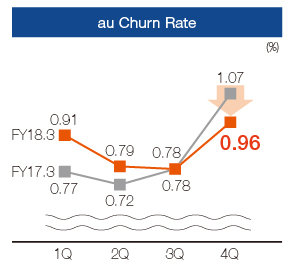 In the domestic telecommunications business, KDDI has believed the most important issue is the rise in au churn rate associated with the expansion of the MVNO market. 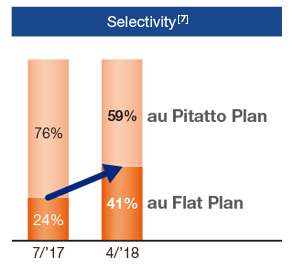 In response to this issue, in July 2017 KDDI introduced two new price plans: The "au Pitatto Plan," under which a flat-rate charge is automatically applied depending on changes in the amount of monthly data use; and the "au Flat Plan," which offers users better value for large-volume data communications. The plans have been very well received by customers, and as of April 8, 2018―nine months since the plans were introduced―subscriptions have already broken the 7 million mark. The "au Pitatto Plan" has been particularly successful, offering not only a reduction in communications fees, but through the application of campaign pricing that provides a ¥1,000 discount on monthly charges for a full year, allows customers to use the service for a low rate from ¥1,980, the same level as the MVNOs. In addition to improvement in the au churn rate following the introduction of this plan, MNP net additions are also on an upward trend. Further, KDDI Group MVNOs including UQ mobile, J:COM MOBILE and BIGLOBE Mobile have also done well in increasing subscriptions, and mobile IDs, the total number of au and the Group MVNOs is steadily growing. Meanwhile , au ARPA rose 1.4% year on year to ¥5,910. 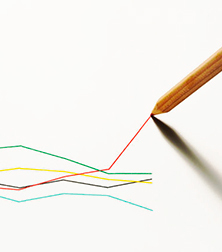 The introduction of new price plans resulted in a shortterm decline in revenue. However, au ARPA increased as a whole, because monthly discounts were not applied to the new price plans, in addition to rises in smartphone penetration rates and subscriptions to large-volume plans (20GB/30GB) due to an increase in monthly data usage volumes, as well as a rise in the number of mobile devices per person associated with an increase in the number of tablet and mobile router subscriptions. "SuperKakeho" + "Data flat fee (1/3/5/20/30)"
KDDI will continue to promote its "au Smart Value" discounts for bundled mobile and fixed-line communications services and bundling with life design services such as "au Denki" (electric power service). In addition, further efforts to promote reduction in churn through the "au Pitatto Plan" and the "au Flat Plan" will target maintaining and expanding the au customer base. At the same time, midto long-term growth in au ARPA and an increase in revenue from Group MVNOs will also aim for the goal of sustainable growth in mobile communications revenues. Maximize the "au Economic Zone"
In addition to steady growth in the domestic telecommunications business, maximizing the au Economic Zone will become a driver of growth going forward. Building on the au customer base, with its strong engagement, and the "au Carrier Billing" and "au WALLET" settlement platforms, KDDI will offer a variety of life design services that respond to customer needs in all areas of people's lives, expanding touchpoints with customers both online and offline. In addition to the au shops, which provide an offline touchpoints with the customer, KDDI has also expanded membership in the online touchpoints "au Smart Pass"  to 15.53 million members as of the end of March 2018. Meanwhile, the "au Smart Pass Premium," an upgraded service launched in January 2017, has expanded to 4.3 million members, and is contributing to growth in value-added ARPA. KDDI's January 2018 acquisition of the shares of AEON Holdings Corporation marked its entry into the education business, and with the February 2018 establishment of KDDI Asset Management Company, Limited a joint venture with Daiwa Securities Group Inc., it has worked to further expand its life design services. 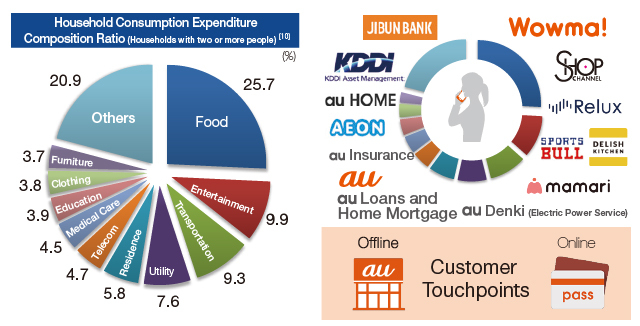 By expanding services to all areas of customers' lives, KDDI can expand not only its customer touchpoints, but also the gross merchandise value in the "au Economic Zone" generated by those services. This contributes to expanding "au Economic Zone Sales" and the additional effect of bundling telecommunications and life design services can also be expected to reduce the au churn rate. "au Smart Pass" + "au Smart Pass Premium"
In the fiscal year ended March 31, 2018, the "au Economic Zone gross merchandise value" reached ¥1.89 trillion, backed by the steady expansion of the settlement, commerce and energy businesses, and KDDI expects that figure to reach ¥2.46 trillion for the year ending March 31, 2019, significantly exceeding the medium-term management target of ¥2.0 trillion. Accompanying that growth, KDDI also expects "au Economic Zone Sales" to climb from ¥560 billion in the fiscal year ended March 31, 2018, to ¥730 billion in the fiscal year ending March 31, 2019, as the expansion of the "au Economic Zone" contributes to growth in performance. KDDI will continue working to enhance its life design services through M&As and through cooperation with its partner companies, with the goal of expanding the "au Economic Zone gross merchandise value" and extending its role as a new axis for growth. Looking at the domestic market in Japan from a long-term perspective, issues such as declining birthrates, an aging society and a shrinking population mean that growth through global business will become even more important going forward. 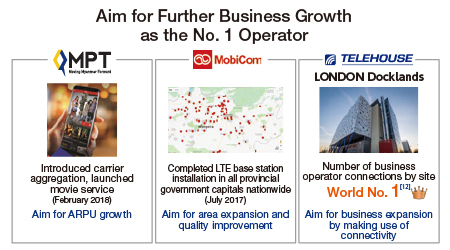 KDDI's global business are growing steadily around two core businesses: 1) the global consumer business, which primarily involves offering telecommunications services to individual customers, mainly in Myanmar and Mongolia; and 2) the global ICT business, which provides corporate customers with data centers, networks and system integration services. In the global consumer business, Myanmar not only saw mobile subscribers increase to 29.0 million as of the end of March 2018, but with the launch of 4x4 MIMO (Multiple Input, Multiple Output) and carrier aggregation (CA), Myanmar's first maximum downlink speed of 300Mbps was also achieved. Since the full-scale roll-out of LTE service, an increase in demand for data transmission and an expansion of value-added services have also brought growth in data ARPU. In Mongolia, the introduction of CA technology in November 2017 also marked the start of high-speed data transmission service offering maximum downlink speeds of 225Mbps. KDDI will continue working toward expanding demand for data transmission as it seeks further growth in data ARPU. As part of the global ICT business, KDDI's "TELEHOUSE" data center business operates in 12 countries and regions, 23 cities and 47 sites around the world. In particular, TELEHOUSE LONDON Docklands can proudly point to being the World No. 1  for connections, and in December 2017 began offering "AWS (Amazon Web Services) Direct Connect," further enhancing connectivity and contributing to building a low-latency, secure cloud environment. KDDI will continue building on both its global consumer business and global ICT business as it targets even greater growth. To promote the integration of telecommunications and life design, the key phrase behind KDDI's growth strategy going forward, we will commit ourselves fully to the following three initiatives. To continue producing excitement, it is essential that we offer new proposals based on new technology. In preparing to create new business models leveraging IoT, in August 2017 KDDI made SORACOM, Inc., a leading company in the IoT field, a consolidated subsidiary. KDDI also aims to begin providing 5G service in 2020, and is working with a wide range of partners to accelerate technology testing and move forward with the creation of new services utilizing 5G. 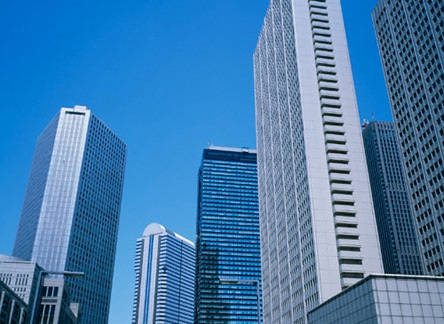 In the solution business, KDDI hopes to address changes in its customers' businesses and contribute to the growth of those businesses across every field of industry. To accomplish that, in the summer of 2018 we opened the "KDDI DIGITAL GATE," a site for business development in the IoT and 5G era. We will work to build new business models, joining with our corporate customers in creating new value. To survive cross-industry competition will require a deep understanding of our customers and the ability to continue proposing services that customers can feel comfortable with. To strengthen its capabilities in the field of big data analytics, which will become the base for all types of business going forward, KDDI has established ARISE analytics Co., Ltd. in a joint venture with Accenture Japan Ltd. ARISE analytics plays a central role in the utilization of KDDI Group data, and in telecommunications,commerce, IoT and other fields. Also they will use AI and other advanced big data analytics to contribute to enhancing customer experience value. KDDI will work to advance data-driven management, and expand ID x ARPA based on knowing more about our customers. Based on a Group management approach, and with telecommunications as a cornerstone, KDDI will work to expand its business in conjunction with the companies it has acquired through M&A. From a global perspective, we will aim to expand the global consumer business centered in Southeast Asia, and the data center business in Europe, which continues to see steady growth. As the first step in the integration of telecommunications and life design, KDDI announced the "au Flat Plan 25 Netflix Pack" price plan that combines au mobile communications fees with Netflix content fees for a flat rate, a first for Japan in May 2018. As video viewership via smartphones continues to grow, this plan allows customers to enjoy high-volume data communications and Netflix's rich content as a set at a special price as we aim to provide improved experience value at the same time. KDDI will continue working to expand life design services appropriate to the changing times, not only alone, but in collaboration with partner companies as well. In its use of cash, KDDI will continue to place the highest priority on growth investment aimed at achieving sustainable income growth. We are considering capital expenditures intended to maintain and strengthen competitiveness, as well as M&As primarily focused on the life design business, a new axis for growth, and the global consumer business centered in Southeast Asia. 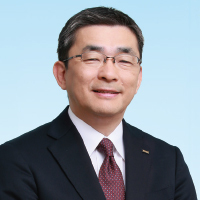 In the fiscal year ending March 31, 2019, KDDI expects to make ¥570 billion in capital expenditures to improve 4G LTE quality and expand area coverage, and to improve communication speeds through CA. In 5G, KDDI is preparing to begin offering service at the 2020 Tokyo Olympic and Paralympic Games. Although the allocation of the 5G spectrum is expected to take place by the end of the fiscal year ending March 31, 2019, for the time being, we plan to operate a non-standalone system in combination with 4G LTE, gradually expanding from areas where service is required, and enhancing efficiency of investment while balancing 5G service profitability with the scale of capital expenditures. With regards to the current medium-term management targets for a cumulative three-year total of ¥500 billion in M&As, in two years KDDI has completed a little more than ¥300 billion in growth investments, including the acquisition of the shares of AEON Holdings Corporation. The remaining approximately ¥200 billion will be incorporated in our performance outlook for the fiscal year ending March 31, 2019. In addition to "maximizing the au Economic Zone" and "ambitiously developing global business," our two new levers for growth, we will also consider M&As aimed at the integration of telecommunications and life design and at strengthening business in the IoT and 5G fields. Regarding shareholder returns, KDDI's approach remains unchanged, with a basic policy of maintaining financial soundness and continuing to pay stable dividends. 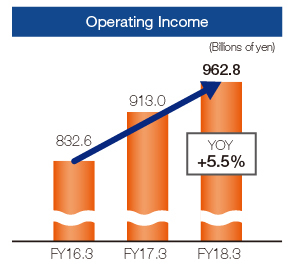 Under the current medium-term management targets, KDDI has committed itself to a minimum payout ratio of above 35%. The dividend for the fiscal year ended March 31, 2018 was up ¥5 per share year on year, for a payout ratio of 38.2%. 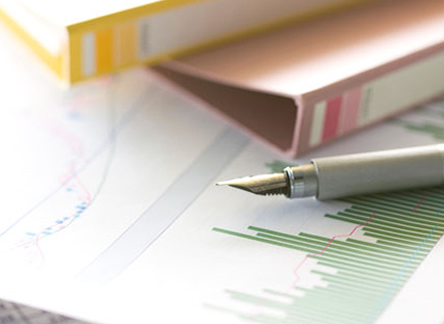 The outlook for the fiscal year ending March 31, 2019 calls for an increase of ¥10 per share year on year and a payout ratio of 38.8%, marking the 17th consecutive year of dividend increases. In addition, KDDI has disclosed it will repurchase ¥150 billion of its own shares in the fiscal year ending March 31, 2019 for its second consecutive buyback, bringing total shareholder returns to ¥390.5 billion. KDDI aims to limit treasury stock to 5% of total shares issued, and will regularly cancel any shares in excess of this amount. On May 16, 2018,KDDI cancelled treasury stock equivalent to 2.13% of the total number of shares issued. Calculation based on the total number of issued shares as of March 31, 2018 (excluding treasury stock). Recent years have seen an acceleration of the international response to global issues, including the Paris Agreement under COP21 , an international framework for addressing climate change, and the sustainable development goals (SDGs)  established by the United Nations to resolve global concerns. Companies are increasingly expected to take the initiative in contributing to the sustainable growth of society through their businesses. 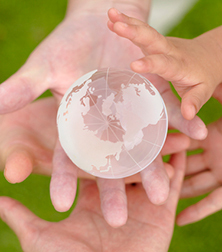 KDDI is engaged in sustainable management aimed at the resolution of social issues and the sustainable development of society. 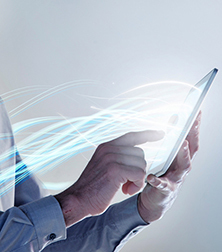 Based on our telecommunications services, we hope to contribute to the growth of a society rich in communication. By following the "KDDI Group Philosophy," we aim to be a company appreciated and trusted by all of our stakeholders. As a telecommunications carrier managing social infrastructure that must work under all sorts of conditions, 24 hours a day, 365 days a year, we have the vital mission of providing reliable communications services to society. The telecommunications business could not exist without borrowing radio waves and other valuable assets that belong to the public. 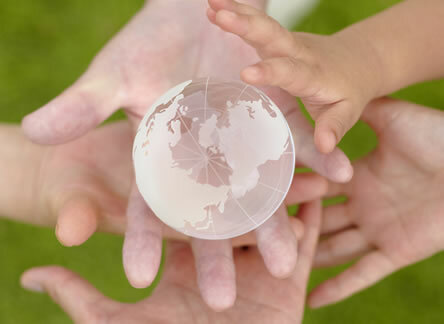 We are therefore aware of our social responsibility to help solve problems faced by society with high aspirations. The "KDDI Group Philosophy" defines our corporate posture and how our employees should tackle issues at work. I believe that it is also the starting point for sustainable management. As we have ambitiously developed global business in recent years, it has become essential that all of our employees take action with a shared set of values to generate synergies and strengthen ties between each business division. In conjunction with the revision of the "KDDI Group Philosophy" in 2013, KDDI has conducted awareness-raising activities for employees inside and outside Japan to help spread the philosophy. We will promote sustainable management by pursuing our mission together as a group of employees that share the "KDDI Group Philosophy." As we strive to be a company that customers can feel closest to and a company that continues to produce excitement, we will contribute even further to the development of a communication-rich society through the integration of telecommunications and life design.